The Old Kenmare Road was described in 1750 as a Grand Jury Road by Charles Smith. It was built by subscription to link Killarney to the sea.It was known as the Glanerought Road. The road was in regular use up to 150 years ago. 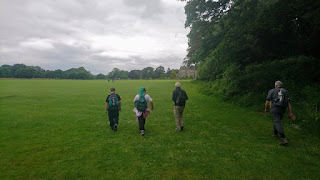 The club walk on Sunday was on this ancient trail. Leaving Kanturk at 08.00 we headed for Muckross House where we parked up. Then got on the pre booked bus for Kenmare. 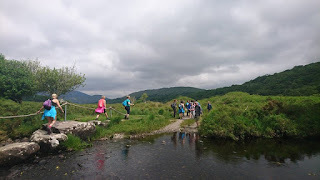 The weather was glorious.We headed up through Molls Gap and Ladies View soon we were in Kenmare. The bus took us to the town land of Goulane. This eliminated a few kilometers of road walking. The steep road soon gave way to a rough track and behind us the views over Kenmare Bay opened up. The Beara Peninsula off in the distance. The faint outline of the Skellig could be seen. Upwards we went until we reached the Windy Gap, here we stopped to take in the views, and some water.At 300 meters this is the highest point of the walk. Peakeen mountain to the West and Knockanaguish to the East. The Windy Gap was well named. Refreshed we pushed on,the trail goes through hilly ground, marshy ground and old oak woods. These woods are last remnants of the oak forests that covered Ireland many centuries ago. The track continues through Esknamucky Glen between Cromaglan mountain and Stumpacommeen. Part or the trail that goes through boggy ground is sleepered. 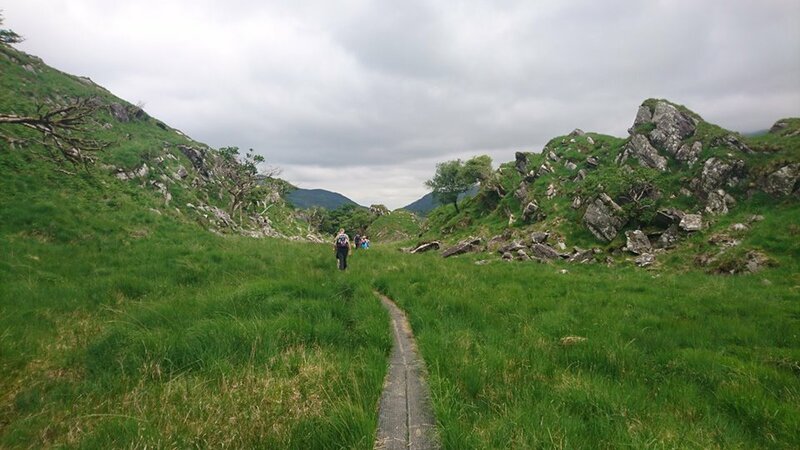 It is an isolated wild landscape between the tourist towns of Kenmare and Killarney. The next Glen we passed through is Crinnagh. Then we came to Cores Cascade where we relaxed near the waterfall. Refreshed we went on our way. Through the valley between Mangerton and Torc mountains. With the Owengarriff river tumbling over the rocks on our left we made our way down by the famous Torc Waterfall. Down the steps and through the underpass to reach the grounds of Muckross House. It was a happy group that finally reached the 🚗 s. We changed and went for tea ☕️/ coffee ☕️. It was great to see so many new faces. It was a fantastic day out and everyone seemed to enjoy it.